Nothing More leaven the melee with melody, often striking a balance between kinetic thrills and keening pop hooks with the skill of a Linkin Park. Formed in 2003, Texan rock quartet Nothing More spent much of the 2000s trying to solidify their line-up and attract mainstream attention. 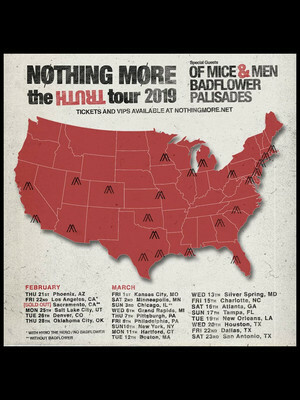 When the band's drummer Johnny Hawkins stepped out from behind the kit and into the role of frontman and lead vocalist, labels and breakthrough success came calling following the release of their fourth album Nothing More in 2014. Five years later, the outfit hits the road on their biggest headline jaunt yet - The Truth Tour 2019. Support comes from Of Mice & Men, Badflower and Palisades. 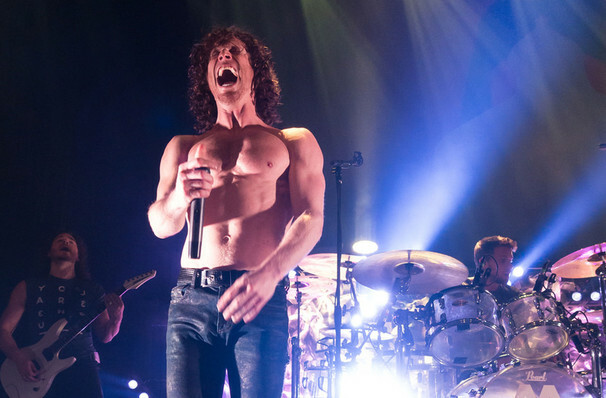 Released in 2017, Nothing More's last record 'The Stories We Tell Ourselves' earned them three 2018 Grammy nominations for Best Rock Performance, Song and Album. Hailed as 'the twisted Blue Man Group of rock and roll', the band sets up two drum kits for their live shows so that Hawkins can join in intermittently, making for a rhythm-filled, raucous gig and energetic live performances that have become their trademark. When they're not crowd surfing, NM champion social causes - one dollar from every ticket sold on tour benefits To Write Love On Her Arms, a non-profit charity that offers guidance to those struggling with addiction and depression. Seen Nothing More? Loved it? Hated it? Sound good to you? Share this page on social media and let your friends know about Nothing More at House of Blues. Please note: The term House of Blues and/or Nothing More as well as all associated graphics, logos, and/or other trademarks, tradenames or copyrights are the property of the House of Blues and/or Nothing More and are used herein for factual descriptive purposes only. We are in no way associated with or authorized by the House of Blues and/or Nothing More and neither that entity nor any of its affiliates have licensed or endorsed us to sell tickets, goods and or services in conjunction with their events.